Cmdr. 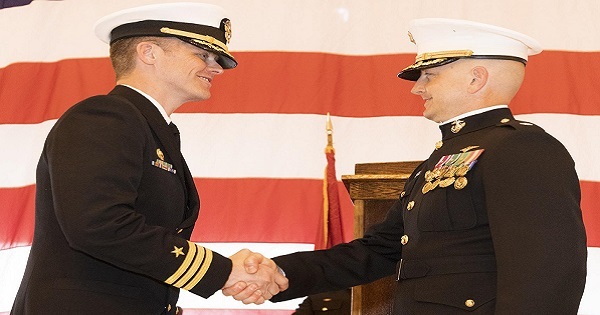 Christopher W. Gavin (left) and Lt. Col. John M. Ennis (right) shake hands after Ennis took lead of Air Test and Evaluation Squadron (HX) 21 during a change of command ceremony April 11 at Patuxent River Naval Air Station. 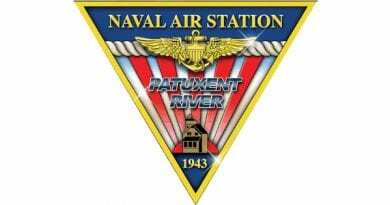 NAVAL AIR WARFARE CENTER AIRCRAFT DIVISION, PATUXENT RIVER, Md.–Air Test and Evaluation Squadron (HX) 21 welcomed its new commanding officer during a ceremony April 11 at Patuxent River Naval Air Station. Col. Richard E. Marigliano, the newest commodore at Naval Test Wing Atlantic, presided over the change of command where Cmdr. 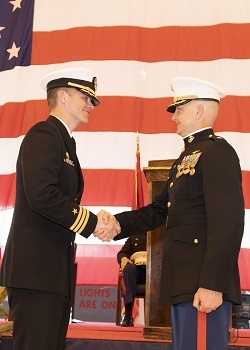 Christopher W. Gavin turned over leadership to Lt. Col. John M. Ennis. Ennis, a graduate of the U.S. 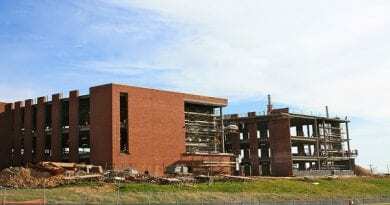 Naval Test Pilot School (USNTPS) and MV-22B pilot, reported to HX-21 as chief test pilot July 2017 following a test career supporting CH-53K and V-22. His operational assignments include Marine Medium Tiltrotor Squadron (HMM/VMM) 266, 3rdBattalion, 8thMarines (2ndDivision), Marine Operational Test and Evaluation Squadron 22, and Marine Air Group 26. Gavin, also a USNTPS graduate and MH-60 Seahawk pilot, assumed command of HX-21 August 2017 following a career supporting numerous H-60 flight test projects and time as senior rotary wing instructor at USNTPS. His fleet assignments include Helicopter Anti-Submarine Squadrons 51 and 37. During Gavin’s tenure at HX-21 he oversaw transition of VH-92A’s developmental test from industry to government, and led the platform to early execution of initial operational assessment and program Milestone C. He also transitioned CH-53K’s entire test team to Patuxent River Naval Air Station from Florida. Gavin moves on to Program Executive Office for Air Anti-Submarine, Assault and Special Mission Programs. HX-21 executes developmental test of Navy and Marine Corps rotary- and tilt-rotor aircraft including major defense programs like V-22, UH-1Y, AH-1Z, CH-53K and MH-60.